Pick up from Guwahati railway station/Airport transfer to your Hotel. PM: Rest and over night at Hotel Dynasty, Guwahati. AM: Visit Kamakhya Temple on Nilachal Hills. PM: Visit Umananda Temple situated on the Peacock Island known as smallest River Island on Earth. (a cultural place where life and culture of Assamese people is beautifully depicted). Evening: Rest and over night at Hotel Dynasty, Guwahati. AM: Breakfast and visit Nabagraha Temple, Balaji Temple and Basistha Ashram and cruises on the River Brahmaputra. PM: Visit Shankardev Kalashetra (a cultural place where life and culture of Assamese people is beautifully depicted). Drive to Shillong (capital of Meghalaya, abode of the clouds) Drive is 110km/3 hours. - Good Vegetarian Restaurant at Jorabat called Makhan Bhog. - Midway halt at Nongpoh for tea / coffee, snacks, fruits. Afternoon: Check in to your hotel- Landmark Hills Shillong. Rest and over night at Landmark Hills Shillong. AM: Full day trip to Cherrapunjee (56Km/2Hrs), the wettest place on earth. (This is a very scenic drive enabling one to see deep gorges and cloud covered hills).Return to Shillong after lunch. PM: Rest and over night at Landmark Hills Shillong. drive to Kaziranga National Park. Drive is 225km/4hours. (The land of Big Five. 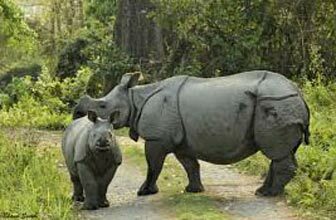 Kaziranga is also known as Hub of one horned Rhinoceros. Recently declared as Tiger Reserve). Afternoon: Check in to your hotel- Landmark Woods in Kaziranga. (A 3 star Jungle Resort with all the modern amenities and ambience. Evening time is there to visit nearby tribal village, Jungle trekking and all other activities available in the hotel. One can also use the swimming pool). PM: Rest and over night at Landmark Woods in Kaziranga. AM: OPTIONAL : Early morning wake up call for Elephant Ride at Rhino land , 1st ride at 05.30hr to 06.30hr 2nd ride at 06.30hr to 07.30hr)- choose any option. Evening: Rest and over night at Landmark Woods in Kaziranga. Drive to Majuli. Drive is 100 km/2 hours. (Majuli is the largest river line Island on Earth. Majuli is also the abode of the Assamese neo-Vaisnavite culture. About 25—26 Satras are remaining now in Majuli of which the Sattras of Kamalabari, Auniati&Garmur are worth mentioning. These Satras are propagating the religious ideology of great Assamese medieval Vaisnavite Saint Sankardeva & Madhavdeva, preaching Satria culture. Majuli has been the cultural capital and the cradle of Assamese civilization for the past five hundred years. The Sattras set up preserve antiques like weapons, utensils, jewellery and other items of cultural significance. Pottery is made in Majuli from beaten clay and burnt in driftwood fired kilns in the same mode carried out by the peoples of the ancient Harappa Civilization. Sociologists have stressed on the preservation of these unique peoples, whose culture and dance forms are untouched by modernism. The handloom work of these tribes is also internationally famous. PM: Check in and rest and over night at Hotel Prashanti at Majuli. PM: Rest and over night at Hotel Prashanti at Majuli. drive to Jorhat. Drive is 1 hours. drive to Manas National Park (A UNESCO world heritage site and Tiger reserve). On the way halt and visit tea estates. Rest for all day and optional Elephant Safari for Dr. Dutt before breakfast. On the way halt and visit Sualkuchi silk mills, which is famous for Golden Silk. PM: Check in and overnight at Hotel Dynasty, Guwahati. Day 15: Tour Ends, drop at Airport for onward destination.